Combine peanut butter, honey, and vanilla in a medium size bowl. I find it easier to combine if I melt the peanut butter and honey first. Add shredded coconut and gluten-free oats to mixture. Stir to combine. I set mine in the refrigerator for 10-15 minutes before adding in the chocolate chips; otherwise, the chocolate chips melt if you chose to melt your peanut butter and honey. Once cooled, add chocolate chips and roll into 1 inch size balls. 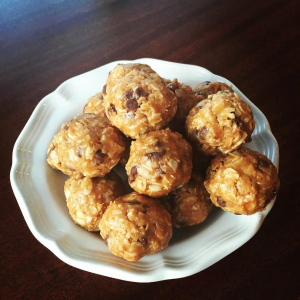 These are the perfect snack to fuel you for a workout or get you through the day! I often eat these before a race. They freeze great so I can keep myself stocked up for a couple of weeks!